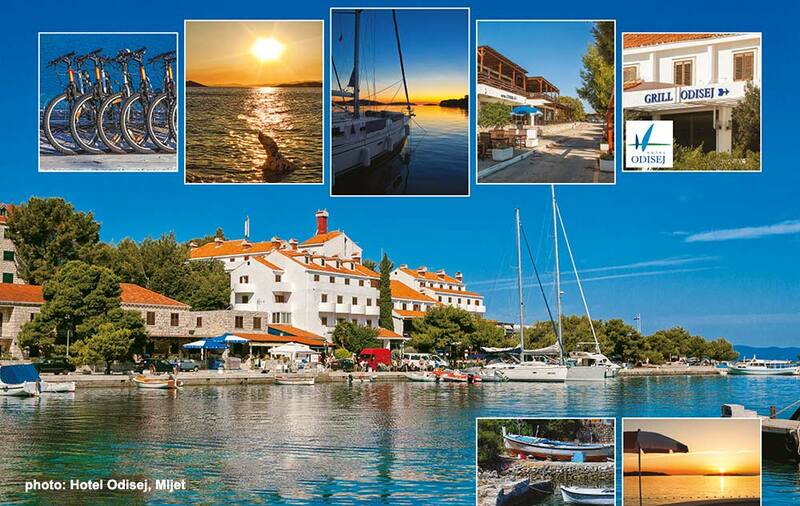 Currently, the Island of Mljet has only one hotel – Hotel Atlas Odisej. The rest of accommodation in Mljet are private rooms, b&bs, apartments and similar. Hotel Odisej (above photo) has 154 rooms and 2 apartments, all air-conditioned, with private facilities and sat tv. Situated in the bay of Pomena this hotel is within a short walking distance from the Mljet lakes – Veliko and Malo Jezero, part of Mljet National Park. Close to the hotel, there is a rocky beach with concrete sunbathing areas from which a regular boat service is available to an isolated naturist beach at the islet across the bay. The hotel is air-conditioned throughout with good facilities, which include a restaurant, pizzeria and beach bar, aperitif bar tavern, lounge, shop and children’s pool, sun terrace, umbrellas and gardens. Leisure and sports activities include diving and sailing school, scuba diving. Hire of yachts, sailing boats, kayaks, canoes and bicycles.